The seller of today’s Nice Price or Crack Pipe sporty Civic says he’s “testing the waters” with his ad. Let’s let him know whether or not he’s all wet. Some people don’t believe in evolution, instead taking solace in the notion that the world and its inhabitants are now as they have always been. When it comes to the Japanese manufacturer, Mitsubishi, we’ve actually seen evolution in action. The company has morphed from a one-time maker of interesting cars to its present state as builder of not so great cars that few give even the slightest consideration outside of the budget-minded car rental customer. That recent history of “devolution” makes the model name of last Friday’s 2005 Mitsubishi Lancer “Evolution” IX MR all the more woebegone. The car’s $23,000 asking price was equally fitting in that it was met with almost no positive sentiment, and the Evo ended up with a 71-percent Crack Pipe loss. Hopefully the seller’s pricing acumen will eventually evolve. How rare must the pickings for fun automotive fare be in a region that you have to travel across these United States in order to find a model that at one time was fairly ubiquitous? A dearth of indigenous models is the only reason I can think of for the seller of this 1986 Honda Civic Si to have travelled from Pennsylvania to Washington State to procure it. And now strangely enough, after having done the transcontinental trek, he’s “testing the water” to sell it in the Keystone State. Now, a quick perusal of the classifieds across the U.S. does affirm the paucity of third generation Si models for sale. Also, noteworthy is that most of those that are up for grabs are all kind of icky. That’s unfortunate since the model is all kinds of fun. 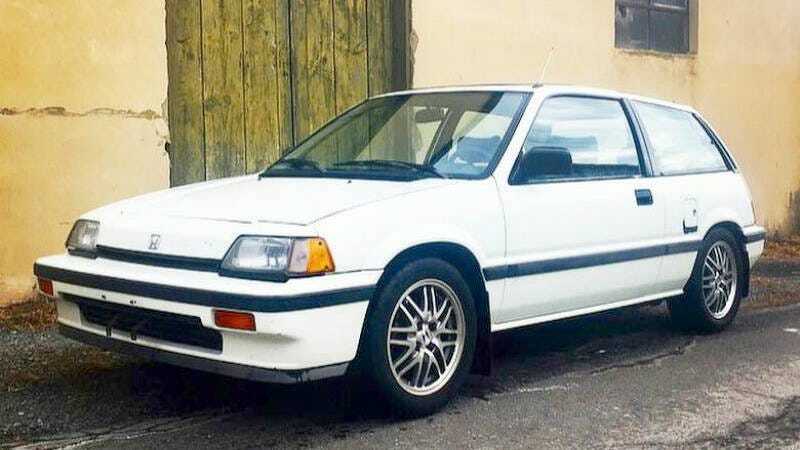 The third generation Civic Si debuted in ’86, and this edition only ran for one more year after that so it’s not like Honda was cranking them out for decades. The changes for the sporty Civic started with a 91-horsepower EW3 engine. That SOHC four offered fuel injection while the lesser Civic models of the era made due with carbureted mills. A five speed manual served as the only transmission offering, and the Si gained some niceties such as a moonroof, sport seats, and a few minor visual aids to spice things up. This one isn’t all that spicy seeing as it’s the same white color as cheap laundry appliances. The paint suffers some flaws as well, most notably a sizable section that’s been completely denuded just below the fuel filler door. In the back, the Si badge has gone missing, so only you will know the car’s true identity. Acura wheels underpin and while they do look nice, they take away from the car’s originality. On the plus side, the interior looks great. The dash is unmarred and the seats, save for some wear on the driver’s off-side bolster, appear intact and clean. The car even rocks its original AM/FM/Cassette head unit for all you tiny button freaks. We don’t get to see the engine bay in the ad, but apparently the car still carries its original mill. That’s done a laudable 185,000 miles. The clutch has only done 20 of those, as the ad notes that it is new. There are also new BFG tires and some Tein gas shocks of unknown age. Overall there doesn’t seem to be any red flags when it comes to this Si. These were very flingable little hatchbacks back in the ‘80s, and in fact it was cars like this that ultimately made European sports cars like the MGB and Fiat 124 feel old and inessential. Today of course, the Civic is as big as the Accord once was. The most fitting size analog in Honda’s contemporary lineup to this one is the Fit, which though it comes with a 130-hp DOHC “Earth Dreams four and can be had with a six-speed stick, still weighs in a good 300 pounds more than this Si. We now have to weigh the seller’s $4,000 price for this old Civic. Seeing as the seller is only “testing the waters” and we wouldn’t want him to drown in a sea of buyers should he have set the price too low. What do you think, does this survivor Civic feel like its worth that $4,000 test price? Or, is this an Si priced more like WTF? At $23,000, Is This 2006 Mitsubishi Lancer Evo IX MR A Memorable Ride? For $7,800, Could This 2003 Honda Civic EP3 Si Make You Sigh?